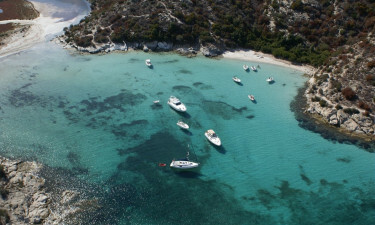 Kalliste is a luxury camping site situated in one of the most beautiful bays in the Mediterranean. 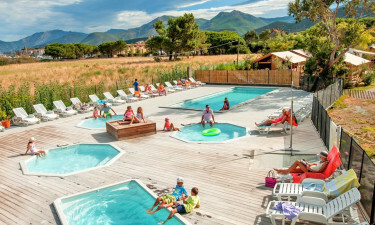 For nature lovers, it offers a unique opportunity to enjoy the peace and harmony found at one of the Earth’s most colourful coastal landscapes, while still having the charming town of St Florent within walking distance. Trusting LUX-camp to secure the perfect mobile home within this holiday camping site will ensure that your camping holiday incorporates the best in camping luxury. Close proximity to spectacular beaches. The comfort of a spacious mobile home. Accessing the Corsican culture in surrounding villages. Corsica is a place of crystal clear azure waters that lap onto white sandy beaches, and Kalliste has these treasures right on its doorstep. This allows those who have booked a mobile home at this luxury camping site via LUX-camp the opportunity to enjoy all the pleasures that these waters provide. Scuba diving, sailing and wakeboarding are just a few of the activities offered that will make this a camping holiday to remember. The old Genoese city of Saint-Florent, which is now a popular resort town, is well worth exploring. Its 15th century citadel provides spectacular views of the town and its magnificent surrounding landscape. The town is also close to Saleccia beach, which is one of the gems of the Mediterranean, and a huge draw-card for residents of the Kalliste luxury camping site. Many visitors arrive by boat, and the sight of the white sails against the blue waters adds to the enchantment of the region. Luxury camping with LUX-camp does not rely on what lies outside of the campsite. A spacious mobile home with an inviting terrace in which to relax with friends and family at the end of a fun-filled day is very much a part of camping luxury. Kalliste also offers superb pool facilities that include a whirlpool, as well as sporting activities for the entire family. Internet terminals allow access should it be required. A very spacious bar / restaurant caters well for the appetites that are worked up by a day filled with various activities. Fresh breads and pizzas are available, as well as a good sampling of local Corsican cuisine. The bar has a warm and friendly atmosphere that invites new friendships and nurtures existing ones. Kalliste’s luxury camp site has a mini-market for those essentials, while a souvenir shop caters well for the people back home. 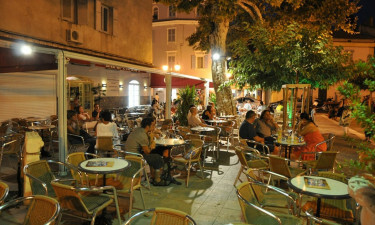 The short walk into Saint-Florent will ensure that any provisions not available at Kalliste’s holiday camping site can be obtained at the town’s well-stocked shops. Shopping here is an adventure in itself, and another opportunity to gain some insight into local culture and unique traditional cuisine.